Here’s a first look at the Ito Maki Pincushion that I’m designing. I used one of those English-Japanese dictionaries to find the Japanese Word for yarn and “Ito” came up, so my appologies if it is in fact the wrong word. This is the Tuna Roll version. 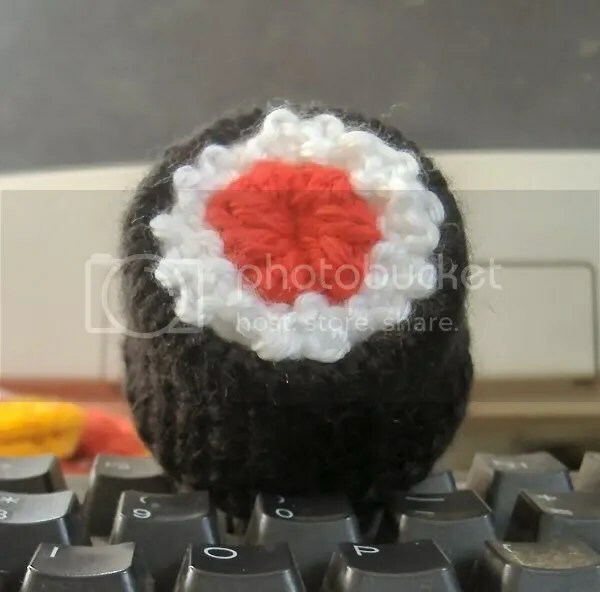 I have a vegetable roll with brown rice on the needles right now and I’m also planning a Salmon Roll and California Roll version as well. 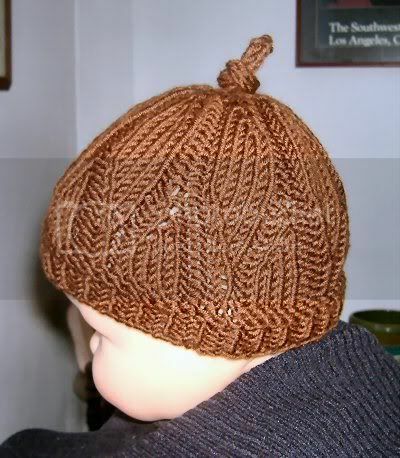 It’s knit using Carron Simply Soft acrylic yarn. I broke out the pliers and beads the other day to make myself some row and stitch markers. 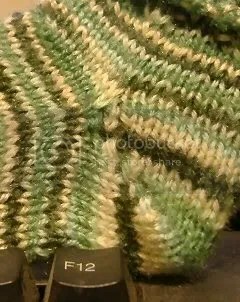 Usually, I just use cut up straws (an idea I got from DIY Network’s Knitty Gritty), but my last black straw is almost gone and I like to have a couple of different colors to mark the begining and midway-point on my knitting. I also hate using a straw segment to mark a row and then have to cut it when I’m finished. I didn’t have any head pins, so I just made little spirals to hold the beads in place. 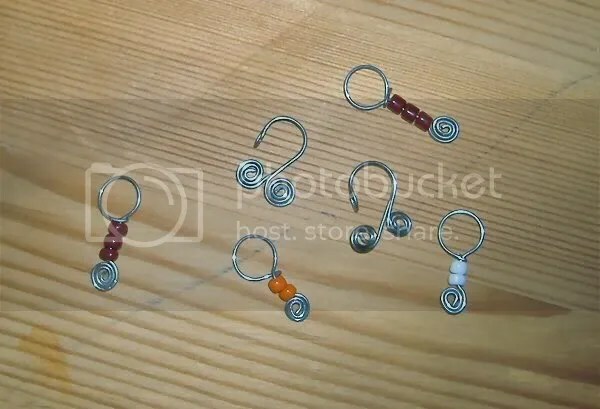 I really like the way the row markers came out – it’s a long piece of wire bent in half and then formed into to the hook with the ends of the wire bent into spirals. I flirted with making ones that looked more like fish-hooks, but I was afraid the wire would snag my yarn. It was alot of fun making them and my friend K gave me some really pretty beads to make some more. The Essene Market Crafts Show was a moderate success. Since my items are so specialized, I wasn’t expecting to sell much unless I came across a cloth-diapering mom with loads of cash to spend. Click on any of the images below to view the full-sized picture. 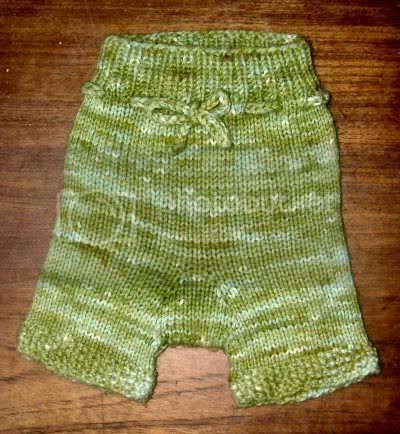 These shorties are knit from hand dyed 100% wool yarn and feature a traditional drawstring waist and seed stitch cuffs. These step-ins are knit from a 85/15 Wool/Mohair blend and are perfect for overnight use. They feature a more generous sizing than my regular small size to accomodate bulkier nighttime diapers as well as being extra thick to prevent leaks. 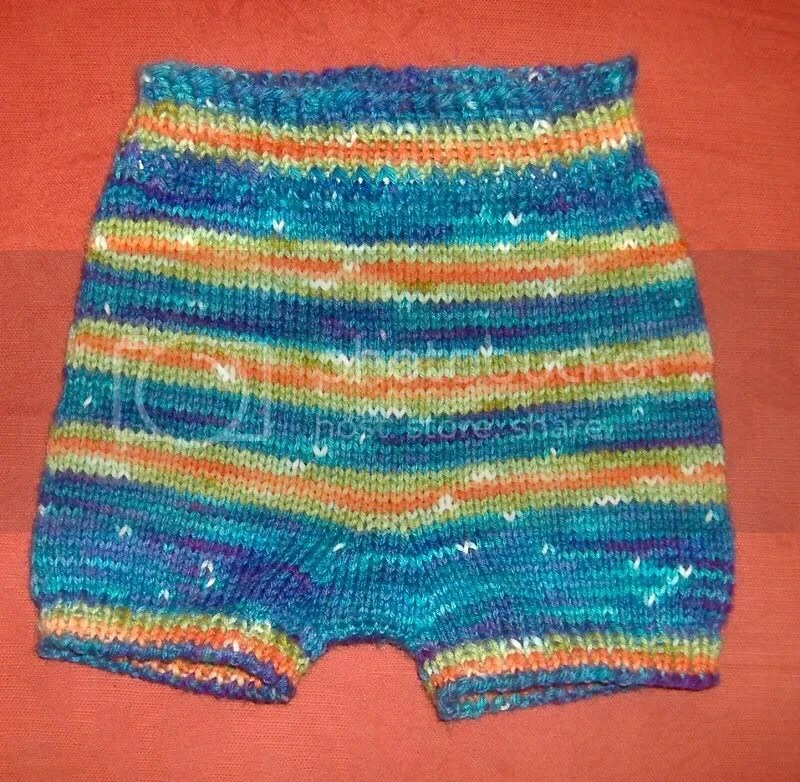 An elastic waist keeps them up without adding additional bulk and ribbed cuffs. These step-ins are knit from hand dyed 100% wool yarn and feature a traditional drawstring waist and ribbed cuffs. 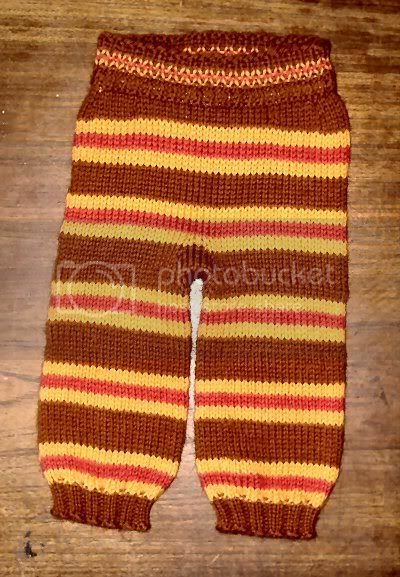 These longies are knit from 100% wool and feature an elastic waist and ribbed cuffs. 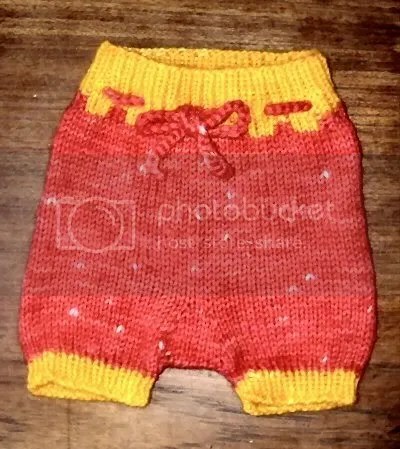 These longies are knit from 100% wool and feature an elastic waist and seed stitch cuffs. This simple cap is knit from 100% extra fine merino wool and features a rolled brim. 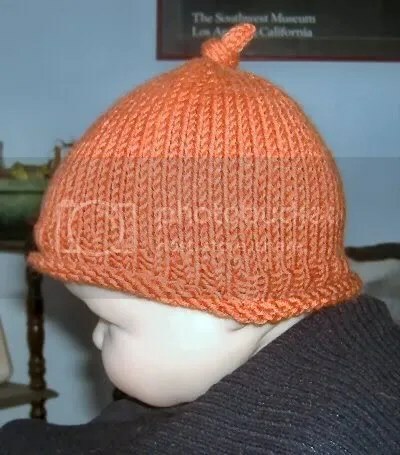 This cap is knit from 100% extra-fine merino wool and features an open-work spiral and a seed stitch brim. 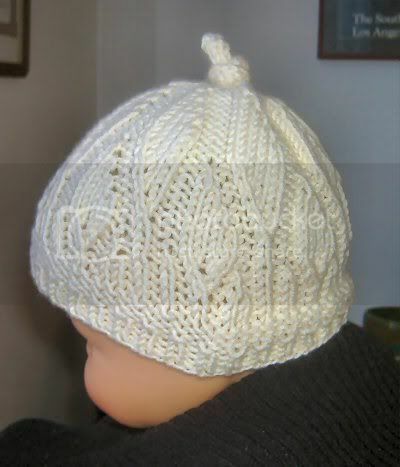 This cap is knit from 100% extra fine merino wool and features a pattern of embossed leaves with a ribbed brim. Thanks to everyone who stopped by and looked at my wares. I’ll have the prices and ordering info for the rest of my stock up later this week. If you have a questions, please leave a comment below or email me at knittykeen @ gmail.com. 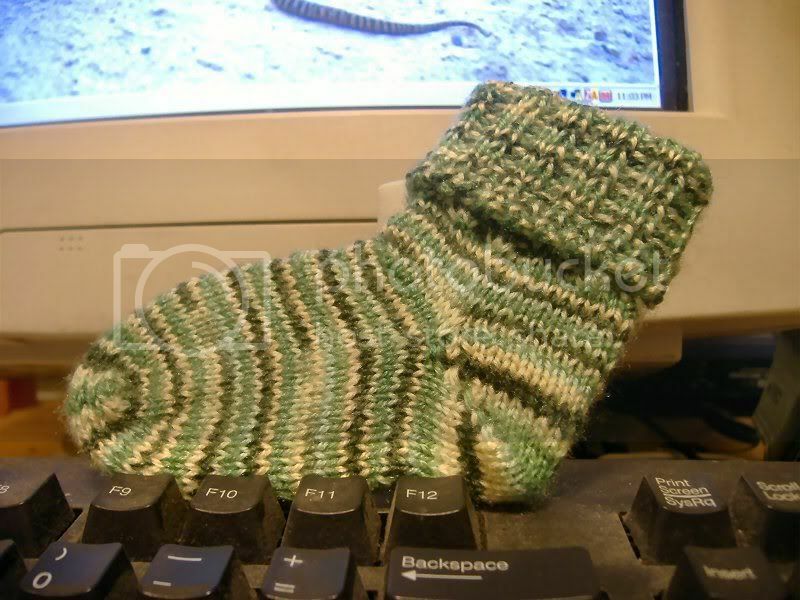 Here are pics of my ultra-cool socks! The other side – still no holes! 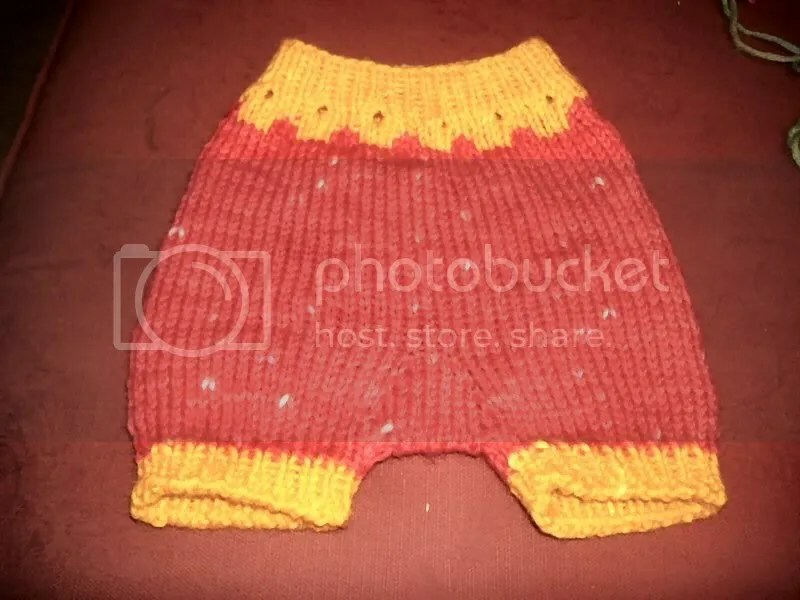 I’m hoping to get some time in this weekend to actually write up a pattern, but realistically it probably won’t get done until after the show. 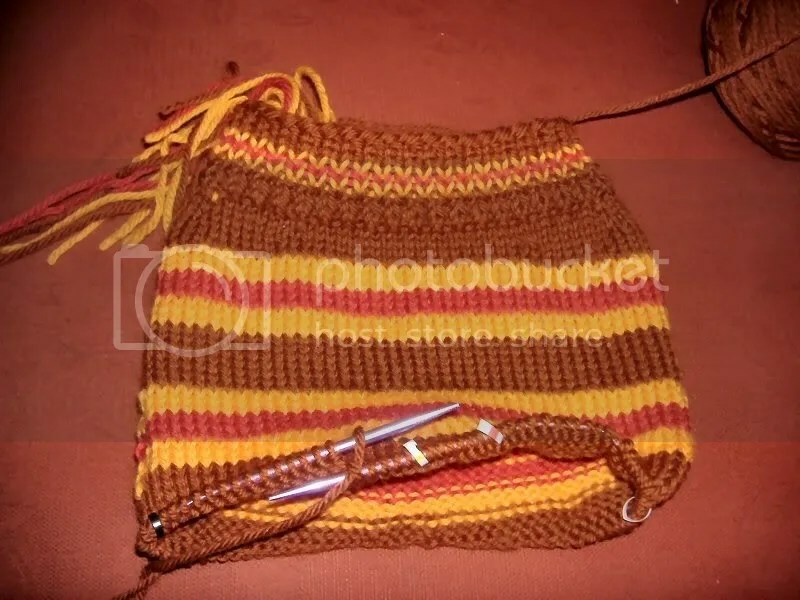 These are almost done – I just have to finish weaving in the ends. I’m very happy with the way they came out. All that remains is to sew the elastic together. We tried them on Z this afternoon and they look like they are a great fit – very trim. Yes, more stripes. This time I’m being smarter about it and stopping to weave my ends in every so often. 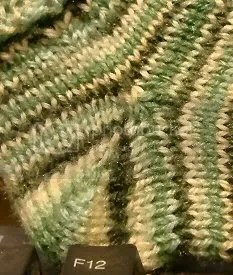 This has a few firsts for me – my first real time cabling and the first time I’m using Lamb’s Pride yarn. 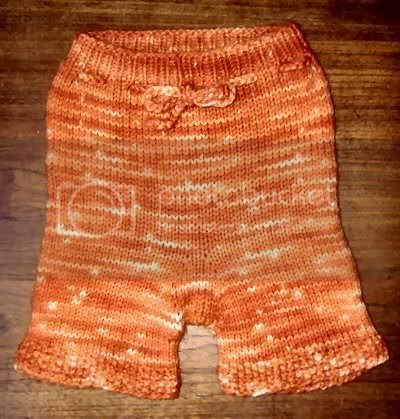 I really like the yarn. It’s a single (one ply) made of 85% wool and 15% mohair, very soft and has a nice sheen to it. 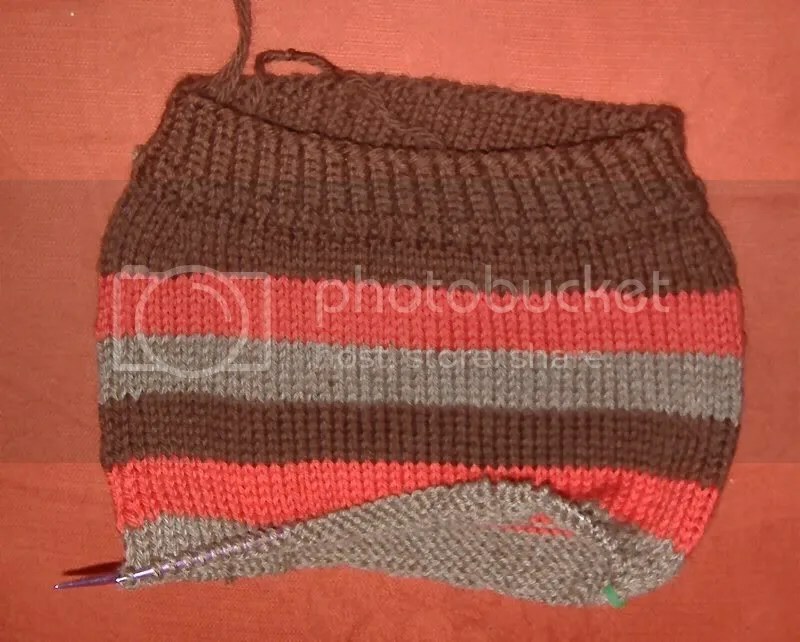 I’ve been wanting to do some fancy stitch work and since the sacque pattern has no short-rows in it, it was the perfect chance to try out cables. 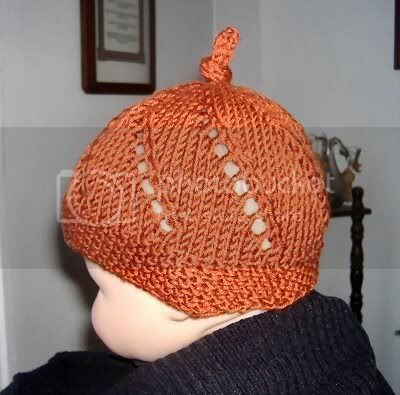 I still haven’t decided how I’ll end it – draw string, ribbing, or actual buttons. If you have an opinion, please let me know. This is an infant/small sized soaker that I have named Snazzy Pants. The style is “step-ins” and I think it’s a keeper. 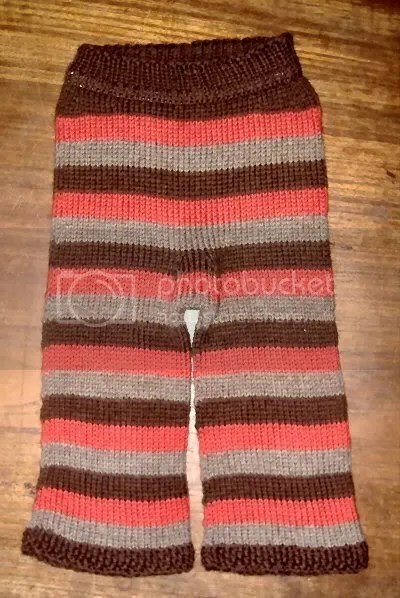 It’s knit with hand-dyed fisherman’s wool and there is a bit of stranding at the waist to creat the crenelations. 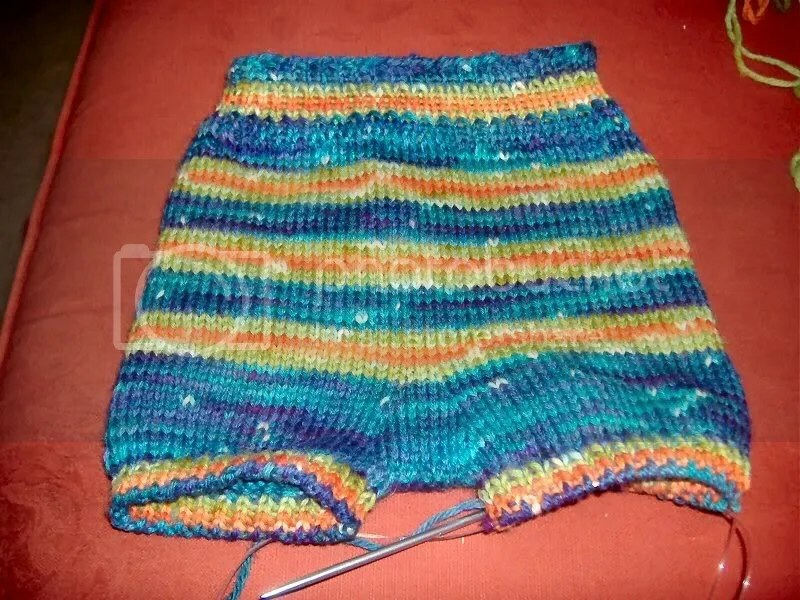 This is a blue/green/orange striped Snazzy Pants step-in soaker in size medium that I am knitting for my friend K’s son Z. All of my measurements look good on paper, now I have to see if they actually fit a child – good to know since I plan on selling them in a few weeks. It’s knit from hand-dyed fisherman’s wool and has a new trick I’m working on – built in elastic just below the ribbing. 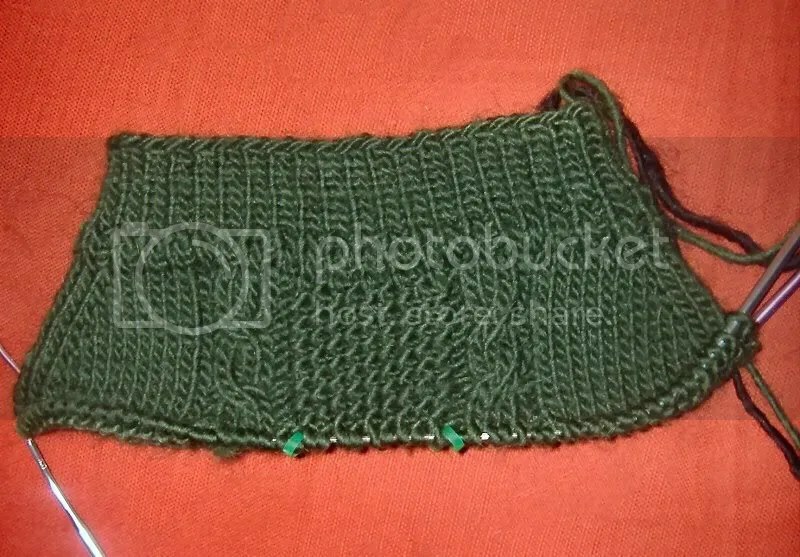 I created a casing by double knitting for a few rounds and I’ll weave in some 3/8″ elastic. 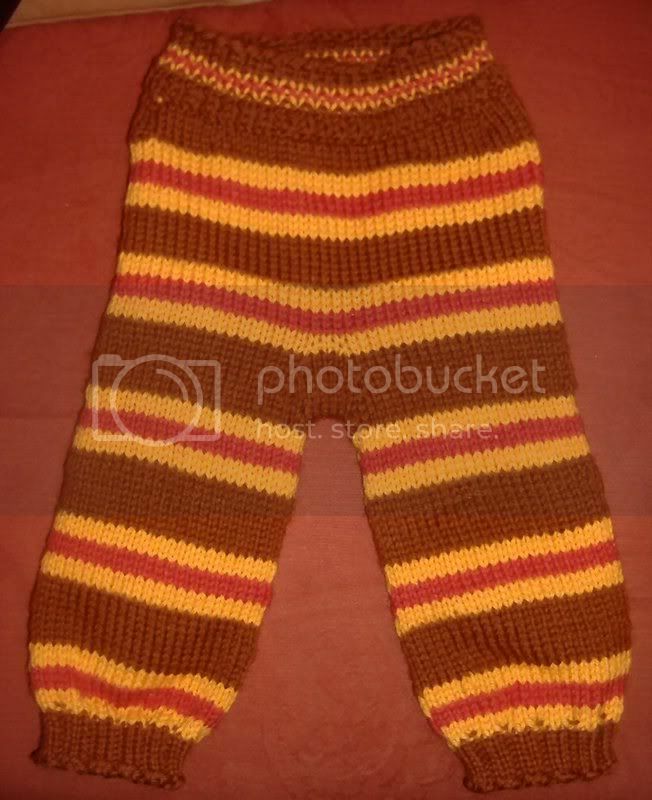 This is a size newborn/preemie striped Snazzy Pants soaker with the built-in elastic, I’m not sure it it will be longies or the step-in style. It’s knit from Cascade 220 which I can give or take – it’s not as heavy as the fisherman’s and not as soft to my hands. I’m hoping that washing and lanolising will cure that. 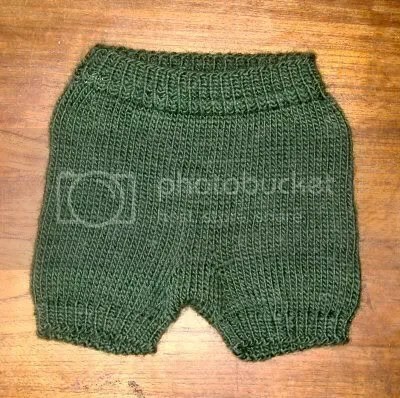 I just e-mailed my submission for Knitty. Wish me luck!